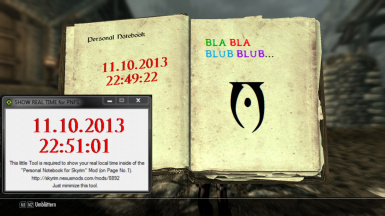 This Tool is showing the current real time on Page 1 of your Personal Notebook (Dairy / Journal Mod). (Updates automaticly in the background while you play). Personal Notebook - Journal Mod - PNFS This Mod is required to make the additional "RealTime for PNFS" mod work. This Tool is showing the current real time on Page 1 of your Personal Notebook. (Updates automaticly in the background while you play every second). and date (not the gametime). expect that there is a modification to page 1 to display the time / date. The tool uses a font from it, if you use it (if not you might see the system default font). with the UAC (i have no solution so far for it expect to install WinXP, Win7, Win8 or Win8.1).